Most engineers consider the oscilloscope their first tool of choice for most hardware development work. Yet very few engineers ever consider how accurate their scope is. Even fewer actually look into it but would be very surprised by what they learned. Before taking the time to make current measurements with a scope, it pays to take the time to understand how accurate your scope is at the settings you need to use for your low current measurements. Most of the major oscilloscope manufacturers place great importance on the timing aspects of their products. While timing accuracy is often spec’d in double-digit ppm, voltage measurement error on the same scope can be as much as the signal level you need to measure in a scope’s lowest volts/division setting. Multi-gigahertz sample rates are fairly common today in mid-range digital scopes today yet most of those scopes only utilize 8-bit A/D converters. The accuracy degrades considerably as the volts/division setting is reduced but in the case of this particular family of scopes even at the 5 volts/division setting the measurement of a 5V level can be wrong by almost 30%. The accuracy at full scale isn’t really important unless you have voltages that require the full scale to be displayed. More important is since the result of the accuracy formula is a voltage, that voltage relative to the voltage you are trying to measure is really the accuracy that matters. For example, at the 10mV per division setting, the full scale accuracy is 6% but if you are trying to measure a 10mV signal the accuracy is only 52%. Even the best accuracy for a voltage equal to the volts/division setting is not very good at ±28% (with 0 offset). What isn’t as obvious is the impact of the display voltage offset. 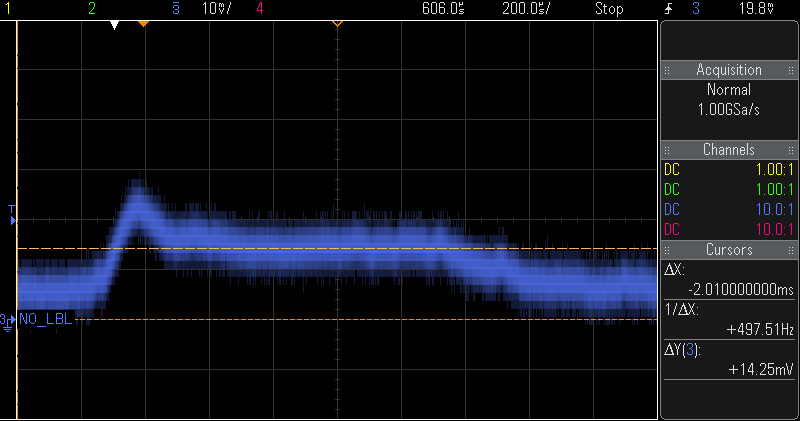 If you change from 100mV/division to 50mV/division to zoom in on the waveform the error only degrades from 30% to 32%. If you also drop the 0V level from the center of the display to the bottom of the display when making this change, the measurement error goes from 30% to 36%. Another thing that you can’t see here is in this case the manufacturer requires a 30 minute warm-up period for the scope to meet the datasheet specifications. If you turn on your scope and start taking measurements immediately or if your scope hasn’t been calibrated in years then your measurement accuracy likely won’t even be this “good”. All of this begs the question “how bad can it really be in real life?”. The images on the next page show a current waveform captured on one of mid-range scopes belonging to the family of products covered by the datasheet that the formula above was taken from. The waveform on the left was taken using the "standard" probe for the scope and the one on the right with the CMicrotek µCP100 current probe. The waveforms show the current draw from a lithium-polymer battery for an 8-bit micro as it wakes up from a sleep state, performs a timer based background task and then returns to sleep. These examples show measurement accuracy in line with the calculations above. Given the measurements with the "standard" probe in the example above (operating current 200% too high and sleep current over 10X too high compared to the micro’s current specs), an engineer could spend several very frustrating weeks trying to solve a power consumption problem that doesn’t exist. This example also illustrates the importance of amplifying the current waveform so that it can be displayed and analyzed more accurately as with the µCP100 example. The wave form captured with the µCP100 current probe are also impacted by the scope’s measurement inaccuracy but are much more closely aligned with reality. This wave form is good enough to show the increased current draw when the micro’s internal A/D convert is turned on and several A/D conversions are performed (the slight “bump” at the fourth vertical reticule from the right edge of the display). Why Not Just Use a Larger Sense Resistor? Doubling the value and switching to 20mV/division only improves the error by 10%. 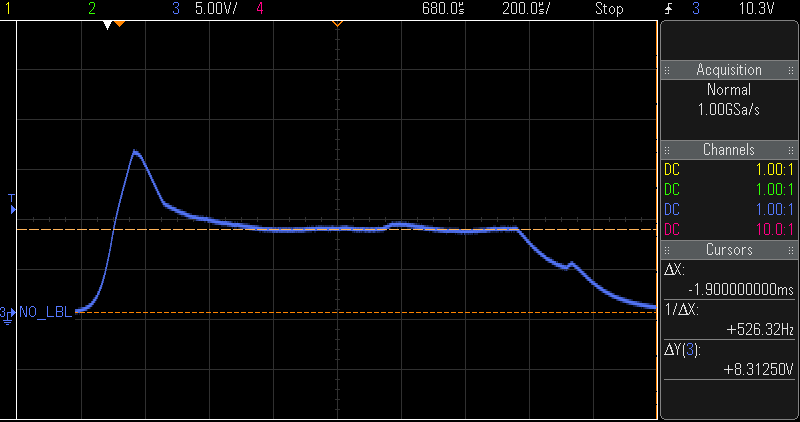 Increasing the value by 5X and switching to 50mV/division improves the error from 52% to 36% but for this test setup would also increase the voltage drop at the peak to 125mV. Depending on the source voltage and circuit design this could be enough to interfere with the circuit’s operation. A decreased voltage level can have an unexpected impact on the current draw of a circuit. For most digital circuits, the current draw will actually decrease slightly as the power supply voltage decreases (due to reduced resistive losses). Other circuits require a certain power level so if the voltage level is decreased the current draw must be increased by a proportional amount to maintain the power level. This will be the case for a battery voltage feeding into a voltage regulator or for the power supply for a wireless radio transmitter. In general, a scope may not be the best tool for highly accurate current measurements but it can still play a huge role in developing firmware-based, power-managed products. Even when used with a low-end 8-bit scope, the µCP100 current probe can provide accurate enough measurements to assess what the firmware is doing. This discussion also points out the importance of understanding the accuracy of the scope you are working with. Even “high dollar” scopes can have surprisingly poor voltage measurement accuracy and the best scopes on the market may provide poor results if not properly calibrated or not allowed to warm-up as called for by the manufacturer.